Integrated Smart Touch View Interface. 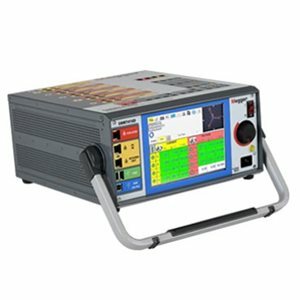 The SMRT410D is a multipurpose, light-weight, field portable test set capable of testing a wide variety of electro-mechanical, solid state and microprocessor-based protective relays, motor overload relays, and similar protective devices. The unit can be operated either manually via the built-in touchscreen user interface, or placed under full computer control via the AVTS, Advanced Visual Testing Software, or the STVI-software running on a PC. In addition, with the open communication architecture, the unit can also be used with third-party software programs such as National Instruments LabVIEW™. The built-in user interface, called the Smart Touch-View Interface™ (STVI), is Megger’s second generation of automatic / semi-automatic manual user interface software. It incorporates a large, easy to read full color, high resolution, high definition, TFT LCD touch-screen display, which displays metered values such as AC and DC Amperes, AC and DC Volts, and Time in both seconds and cycles. Depending on the type of test selected, other values may be displayed, such as Phase Angle, Frequency, Ohms, Watts, VA, or Power Factor.